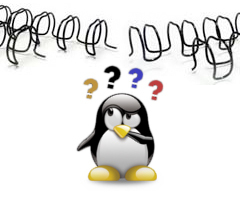 It’s a common call for us – “I want to start offering Wire Binding, but I’m confused at all of the options.” Square holes, round holes, rectangular holes, two holes per inch, and three holes per inch – AAAARRRGH! The choices seem endless and very confusing! So let’s take a moment to demystify Wire Binding hole patterns, styles and pitches. Believe it or not, there actually is a reason for having so many options. Twin Loop Wire (also called Double-O or Double-Loop) was the original Wire Bind and is what you commonly see on calendars, daytimers and notebooks. Twin Loop Wire uses either a square or round hole and is the most professional looking wire bind available. Spiral-0 Wire was an afterthought, coming as an add-on after comb binding became so popular. 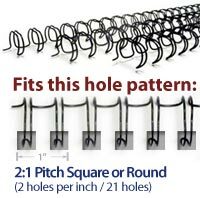 Spiral-O uses the same rectangular 19-hole pattern that is used for comb binding. If you already own a comb binder, Spiral-O can open the door to Wire Binding without having to invest in all new equipment. But be warned: that Spiral-O wire does not look as professional as true Twin Loop Wire, as the ‘looping wires’ are spaced further apart to fill the wider rectangular hole and it can be much more susceptible to bending or disfiguring. 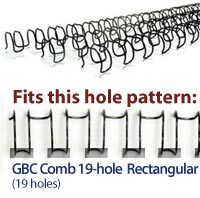 Spiral-O Wire uses the same 19-hole rectangular pattern as plastic comb binding (also called GBC binding) for all sizes of wire. This type of wire binding is much less popular than the Twin Loop or Double-O types shown below. 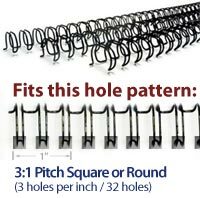 3:1 (3 Holes Per Inch) – a smaller size hole leaves room for 32 holes on an 11” edge, which results in a high-quality look. This pattern can accommodate the smallest of sizes (1/4”) up to 9/16”, which is about 120 sheets. 2:1 (2 Holes Per Inch) – when a books gets larger than 120 sheets, you need a little more space between the holes to allow the pages to turn freely, thus the reason that the industry switches the standard to a 2:1 pattern. This pattern can accommodate documents up to 1-1/4”, which is about 265 sheets! Square or Round Holes – square holes for Twin Loop Wire are the most popular, but round holes are sometimes found on a few machines. All of the office-duty machines that CFS offers use the square hole pattern. So those are the reasons that we have so many options for wire binding. Still confused? No problem – give us a call or drop us an email and we’d be happy to confuse you even further! What binding option is the most popular in your facility today? Share your thoughts in the comments below.